Everyone wants to make a good first impression. If you’re one of the 30+ million small business owners in the U.S., you had to make a good first impression when you met with an investor or secured a loan. The window to make a lasting first impression is only seven seconds. If you sell a product, that means your brand’s product label has to grab someone’s attention fast. A lot of entrepreneurs come up with crazy color schemes and wacky fonts. They grab a consumer’s attention, but not always in a positive way. So, how do you create a label that sells your product and elevates your brand? We’re going to show you how in the step by step guide below. If your intended customer is GenX female professionals, you need a product label design that targets that demographic. Research marketing strategies to help your product labeling attract the customer you want. You know why your product is a must have, so express that. Tailor it to the consumer’s problem and explain in a simple, clear, and creative way how your product fills their need. Keep your brand’s vision and authenticity in your design, but do so in a way that makes the GenX professional reach into their wallet. Decide on product label design based on your product and market. If you sell a food or beverage, you’ll need a nutrition/ingredient label. The same goes for the health and beauty industries. Wraparound labels are ideal for these markets because you need to display a lot of information. Your brand’s logo design goes on the front and your mandatory information like nutrition and your barcode will be on the back. If you haven’t applied for a GS1 Company Prefix yet, you’re going to need to do that to get a barcode. If you paper goods, you won’t need an ingredient label but you’ll still need a barcode. Keeping your product packaging in mind, check out some label making software and see which kind of label design fits your package the best. After you decide on the type of label you want, think about if you’d benefit from enhancements like security labels or tamper-evident tags. 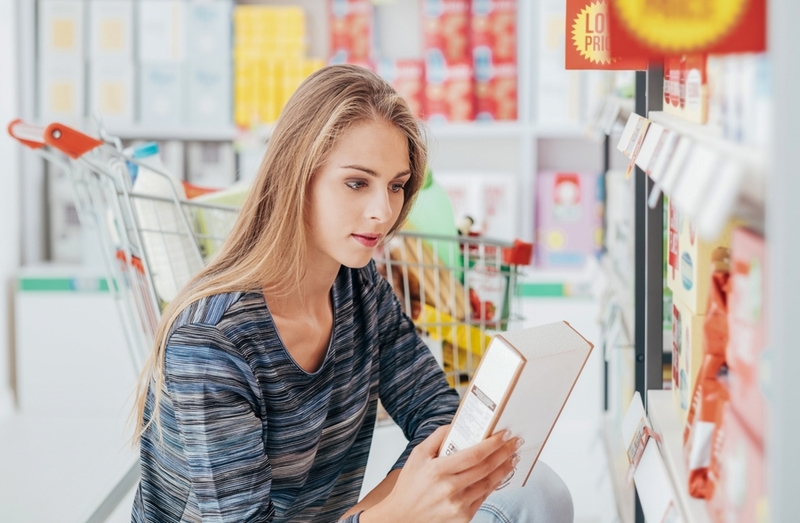 64% of consumers say they buy a product for the first time based on its packaging. You already know you have seven seconds to make a good impression but you also need to get your brand’s message out in a clear and simple way. During your design process, think of a few words that describe your product’s function and what you want customers to know about it. Don’t overdo it, as you don’t have enough space to list all the wonderful qualities your product has. When you started your company, you designed a logo and company name. Your logo will be on your label design but when you get to that step, you may realize your colors don’t express your brand’s philosophy. Aside from black and white, blue, and red are popular colors for brand design and product labeling. But there’s “meaning” behind the colors themselves that may conflict with your product. Did you know 60% of the companies on the Fortune 500 list use blue as the main color on their logo? It’s because blue represents confidence. Red, represents urgency, warning, and danger. And, yes, passion. But there’s a reason clearance sales and warning signs use the color red. Green gets used by a variety of different markets because it evokes a lot of different emotions. Financial companies use it to express money and health food companies use it for vitality. Again, the point is to stand out but not be too busy. Confusion or clutter won’t attract any new customer. You also need to consider the color of your package. If it’s white, any color will work but if it’s clear, what color is the product itself? If it’s green, using orange on your label won’t complement it so pick a color that does. When you create a label, you’ll find out how little space you actually have to work with. This is where using typographic pairing comes in. Designers use typographic pairing to get out important info by pairing different fonts. For example, you’ve seen a product in the grocery store that has “Fresh” in a larger bolder font than the product description. You want to keep this to two, three max, fonts. Using more tends to get confusing for the consumer because it’s visual overload. A white label will be more cost-effective than a pink one but it serves another purpose. You can use white as emphasis. Like typographic pairing, white separates and distinguishes different information. It’s a minimalist design strategy, but it works because it’s uncluttered and clean. If your logo design is bright orange, white will tone it down, while still standing out. If you decide you prefer a white label, consider illustrations that enhance the label design without cluttering it. In the beauty industry, accents that express feelings of warmth are popular. Organic food companies add fruit or veggie illustrations on their labels. Consumers don’t need to see an illustration on a product label to know what they’re getting but it does add a nice detail. Keep in mind you’ll need a QR code/UPC on your label so be careful when you’re thinking about using black accents or elements on the back. Don’t feel pressured into using decorations, decorations, or accents. It’s about your brand’s aesthetic and creating a label you’re proud of! As you can see, when it comes to product labels, having a simple design is key. If you design it right, you’ll stand out in a crowded marketplace and still stay true to your brand’s message. If you’d like to learn about other business challenges like inventory control visit our blog that details mistakes you need to avoid. Contact us for information on our services or if you have any questions.